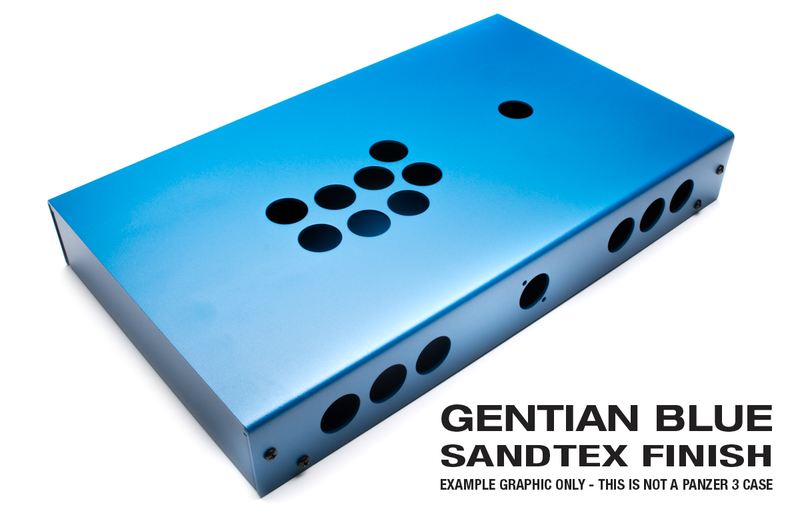 The third Panzer Fight Stick is the culmination of 4 years of Fight Stick design and inputs from the community. I have taken elements from every iteration of the Panzer lineup and incorporated them into the perfect Panzer Fight Stick. It features: the OG's size, the Widebody's Plexi Top, the Korean Edition's Feet, the 2.0's EZ BUILD ("System of Systems") concept and a few new features. More Auxiliary Functions. When coupled with the Brook Universal Fighting Board, your fight stick build is usually limited due to not having enough buttons or cutouts. The Panzer 3 allow you to use START, SELECT, HOME, TOUCHPAD CLICK, L3, and R3. Additionally, using the Cherry™ toggle switch you can shift your lever to Left Analog Stick Mode, Right Analog Stick Mode, or Direction Pad Mode with ease. Front Button Lock. 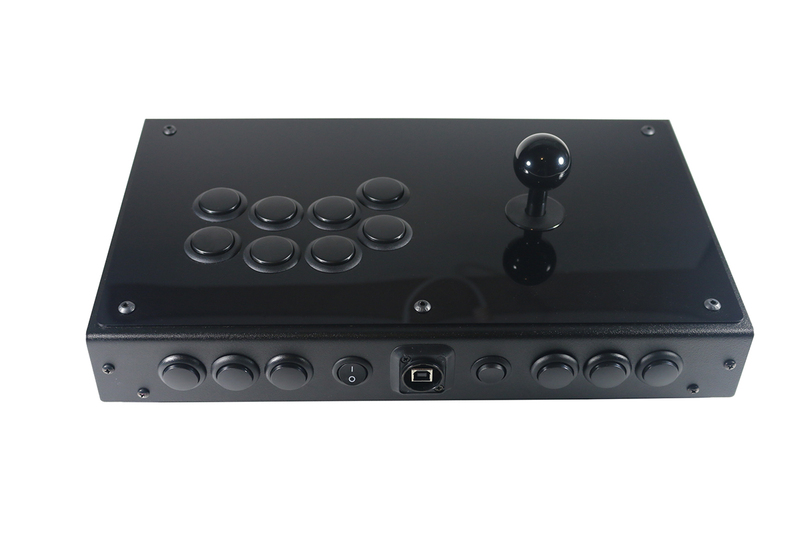 All Panzer Fight Stick 3's feature an included Cherry™ toggle switch that disables or "locks" the front buttons. This MECHANICAL kill switch prevents accidental bumps or presses that can cause you to lose a match. In my opinion, this is the best way to disable those buttons as the software enabled locks used by most Fight Sticks can fail. The front panel lock can lock out the LS/RS/DP mode switch as well by setting the internal switch to the appropriate position. Wide Sega Candy Cabinet Influenced Layout. Today's mass marketed fight sticks all use the same Vewlix inspired layout. It's not ergonomic and can make deadly match ending combos unattainable. The curved feel of the 2P layout on Sega's Candy Cabinets makes all buttons easier to hit due to them matching the natural curve of your fingers. Additionally, the lever is spaced to 95mm instead of the usual 59mm since you don't have to share space with a friend sitting right next to you at a cabinet. Strength. 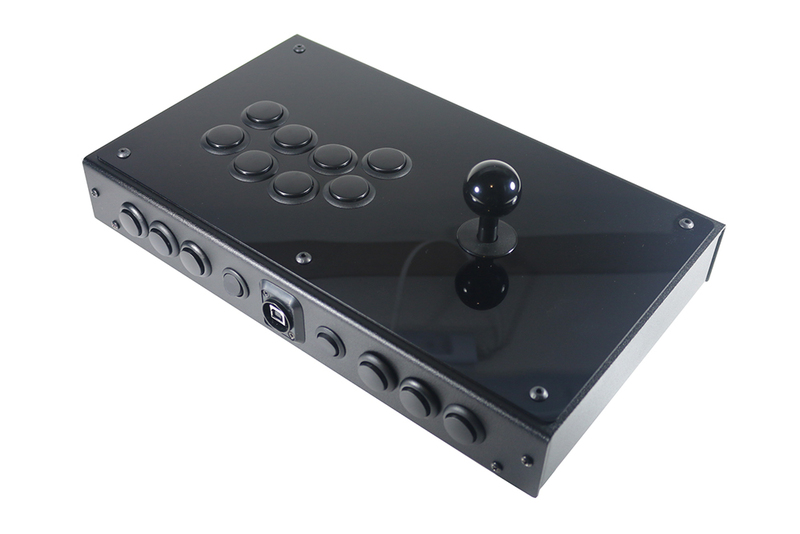 Each Panzer Fight Stick 3 is constructed with 14 gauge cold rolled steel and then powder coated. This ensures that the stick is sturdy and the finish is scratch resistant offering years quality use. 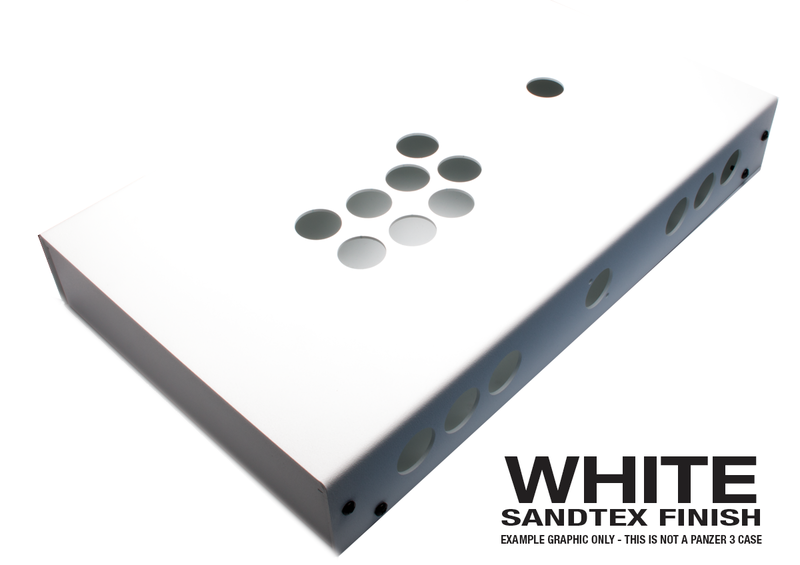 The Panzer Fight Stick 3 features the Jasen's Customs unique EZ BUILD system creating an environment where everyone can build their fight stick quickly and cleanly. No special tools or skills required. Each button, joystick, and board plugs into each other cleanly and neatly with ribbon cables or custom designed wiring harness. The best part? They are all included! An average build can be accomplished within 30 minutes and it will look great every time. 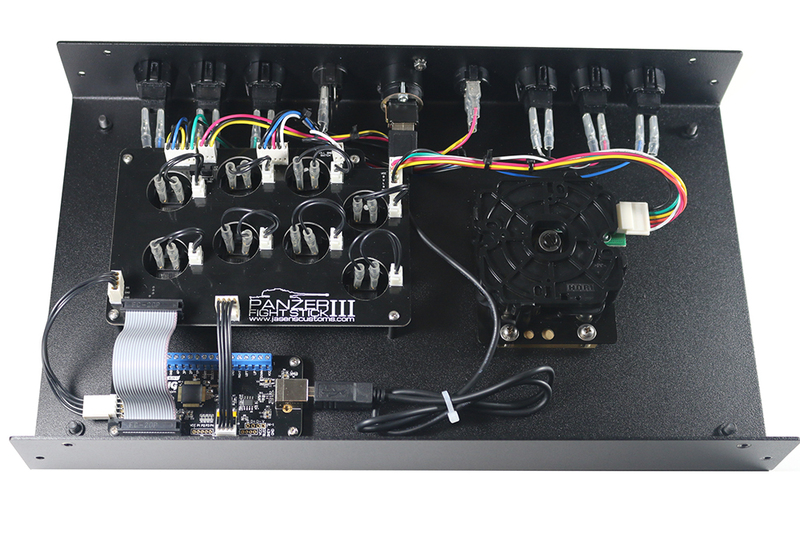 Each Panzer Fight Stick 3 includes one main PCB that links the front facing LOCK switch, RS/DP/LS switch, all buttons and the PCB you chose together and makes connection to a Brook Universal Fighting Board or PS360+ a piece of cake. Everyone has a PS3, PS4, XBOX 360, or XBOX ONE! If you have one you bet your buddy has the other. Why would you want a stick that only works on one or the other? Don't give up your home field advantage by using someone else's gear. 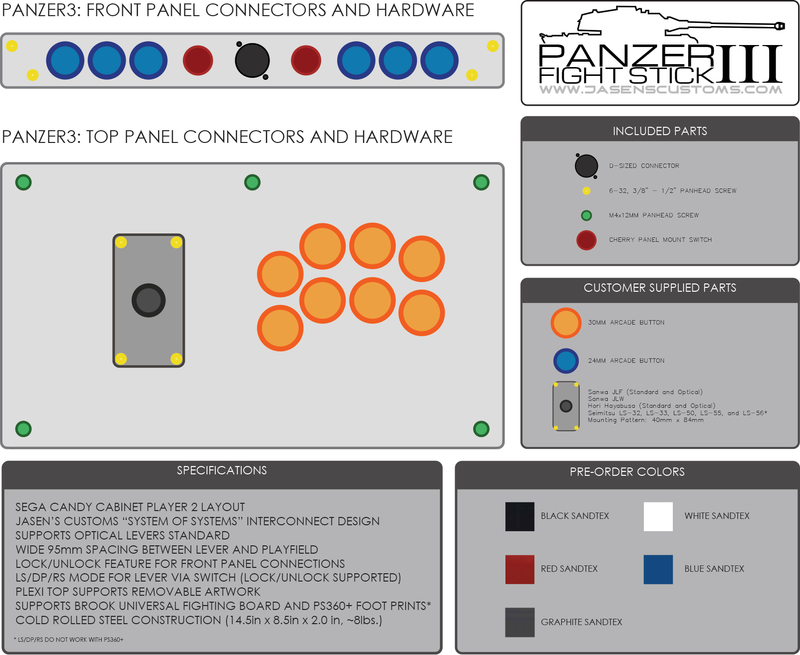 I wanted a stick that could work on everything possible, hencethe Panzer 3 was designed around the Brook Universal Fighting Board and the PS360+ as the brain for console and PC gaming; both proven piecse of tech that the community adores. You can order your Brook Universal Fighting Board with the kit and it will come with all required headers pre-soldered! 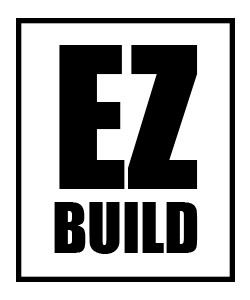 The JCC EZ BUILD system. Internal USB cable, main common PCB, internal wiring. 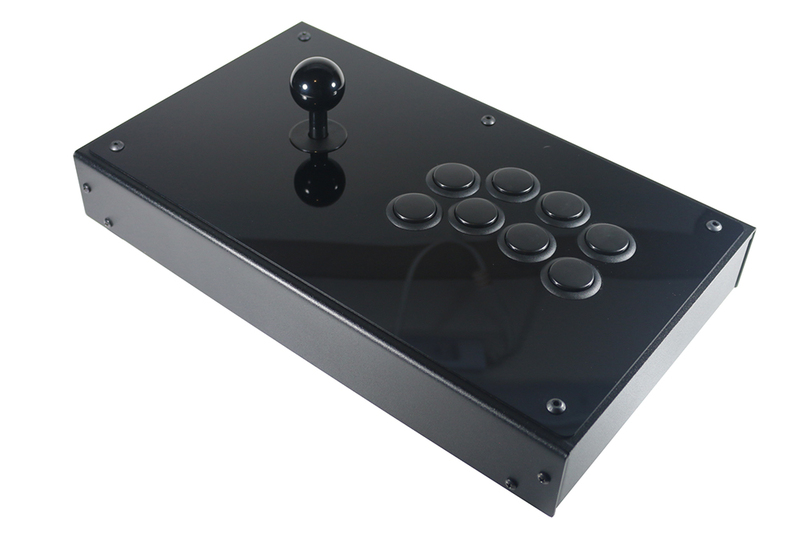 Internal wiring accomodates standard Japanese levers and buttons including the popular Hori Hayabusa Optical. Internal Wiring include two lever cables. One supports a standard 5 pin connector, the other supports a 6 pin connector used by optical levers. Get your Panzer 3 parts from my friends over at ArcadeShock or Paradise Arcade Just click there logo to visit. 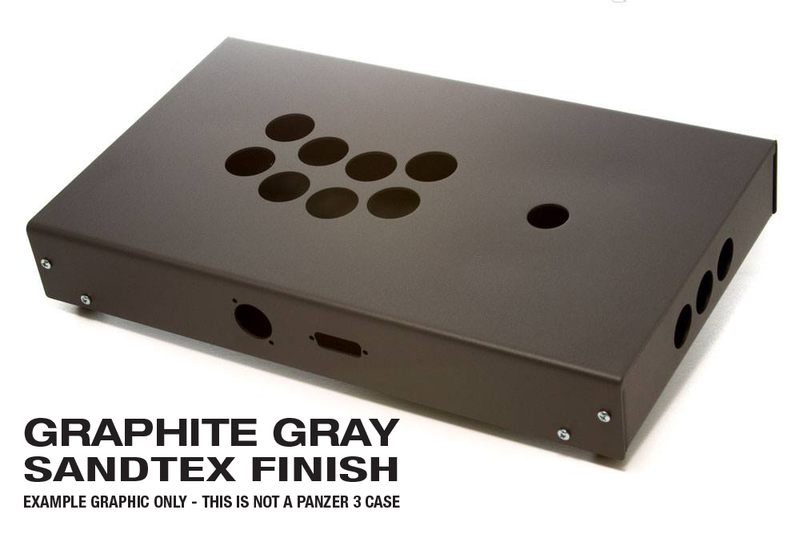 Pictures provided show the additional colors available for the Panzer 3. Cases shown are not Panzer 3 cases but are representative of the colors offered. Get your custom artwork printed and cut to perfection from Art H. over at Tek-Innovations.com. Art has been supporting the Fighting Game Community for years and I have the utmost trust and confidence in the quality product he provides. 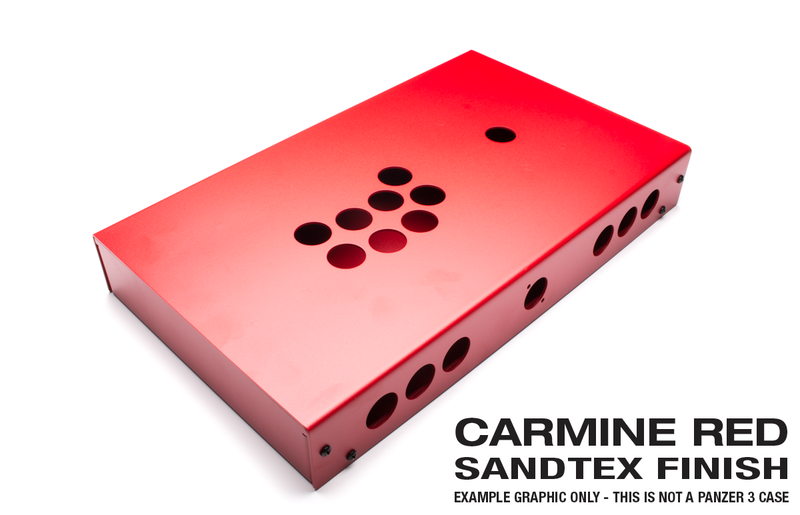 They have all of the required engineering drawings to make sure your new plexi and artwork fit with perfection. Stand Offs for the Popular PS360+ Multi-System PCB and Brook Universal Fighting Board. Dimensions: 14.5" x 8.5" x 2.0"
Does the stick look over engineered? Well, that's because it is. It was designed to look and feel good while being strong and and virtually indestructible. Hit it with hammer... you might dent it a little bit. Hit the competitor's stick with hammer and watch it shatter. You feel the quality when you pick this stick up and know it's going to last. Console auto detection - The only PCB with (PS3 / PS4 / Xbox 360 / Xbox One) auto detection on the market! Press and Hold 1P for PS3, then Plug the stick in. Press and Hold 2P for PS4, then Plug the stick in. Press and Hold 3P for Xbox 360, then Plug the stick in. Press and Hold 4P for Xbox One, then Plug the stick in. Press and Hold 1K for Wii U - Pokken Tournament, then Plug the stick in. In order to prevent unexpected errors, Brook recommends you switch to Xbox 360 mode manually before plugging in to PC running Windows 8.1 or earlier.